BMW continues to increase China sales of models such as the long-wheelbase 5 series, but CEO Norbert Reithofer fears that margins will shrink as the market's growth normalizes. Breaking from his scripted talking points, BMW CEO Norbert Reithofer delivered the most candid warning yet by a German automaker on China. "We were really spoiled the last few years by the growth rates," he said in March. "But we saw in 2014 that they were increasingly on the decline and above all, it was no longer possible to achieve the kind of contribution margins we had three or four years ago." Weeks later Audi, China's premium market leader, said its March sales there rose just 1.5 percent. And Volkswagen brand failed to increase volumes in China for the fifth month out of the past six. China is no longer a tide lifting all boats. German automakers are most at risk from a slowdown in the world's largest auto market, but all major global auto companies will be hit. Experts say that the era of effortless double-digit volume gains and fat profit margins in China is over. Sales slowed to a historically tepid 9.9 percent gain to 19.7 million passenger cars in 2014, as China's economy recorded its slowest expansion in almost a quarter century. Much of the rise was due to a surge in cheap SUVs and minivans sold by Chinese brands. In 2015, the China Association of Automobile Manufacturers expects passenger vehicle sales to rise 8 percent to 21.3 million units. Automakers say that these changes are the typical growing pains experienced in a maturing market. Lower percentage gains from a higher base still translate into large overall increases in car sales, they note. But China's role is far more crucial than executives admit, accounting for a quarter of all global car sales by European automakers last year, IHS Automotive says. China also accounted for 40 percent of all automakers' global profits last year -- roughly as much as Europe and North America combined -- a recent McKinsey study found. 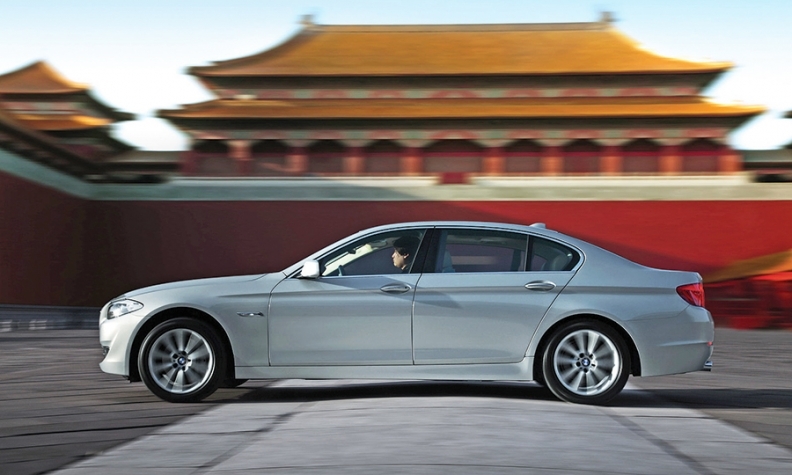 "BMW management's comments on China need to be heeded," Bernstein analyst Max Warburton wrote. "Demand is easing; consumers are pickier; [they] buy smaller engines and demand discounts. This is going to catch up with everyone." VW and the Ford brand had cut prices by 5 to 10 percent, he noted. China is turning its back on the debt-financed property and infrastructure bonanza that fueled its growth. That economic model lifted overall wealth and income standards, but it also led to dangerous levels of pollution and speculative real-estate inflation. McKinsey's economic think tank, MGI, found that the country's public- and private-sector debt has nearly quadrupled since the precrisis year of 2007, to $28.2 trillion. China is now more indebted than the U.S. relative to the size of its own economy. Besides a cyclical downturn, carmakers also have to contend with Chinese attempts to rein in pollution and manage congestion. Porsche finance chief Lutz Meschke fears authorities might eventually ban all cars running on gasoline from cities such as Beijing and Shanghai, especially now that the Chinese documentary Under the Dome has built awareness of the environmental problems. To guarantee it won't be shut out, Porsche is developing an electric car; Meschke calls it a "life insurance policy." The government is subsidizing a fledgling market for so-called New Energy Vehicles: electric and plug-in hybrid vehicles that can go at least 50 km (31 miles) on electricity. It targets a half-million sales this year. That helps Chinese brands because only locally built NEVs benefit from subsidies. But the NEVs could cause carbon dioxide levels to rise in the short term because the country's power grid relies on burning coal. Boston Consulting Group's Marco Gerrits, head of the automotive practice in Greater China, warns that the market is becoming hypercompetitive because of these cyclical and structural problems. "Overall profits are coming under significant stress in the Chinese market," he said. "Are carmakers prepared? I don't think so. They won't be able to offset this with cost reductions and productivity gains." VW is expanding production to build 5 million cars in China by 2019, an annual increase of more than 7 percent, but it is already starting to become cautious. "Under no circumstances will we risk building up overcapacity," VW Group China boss Jochem Heizmann told Automotive News. VW is heavily dependent on China. Last year, group volumes in China for the first time topped those in Western Europe and the U.S. combined. Bernstein estimates that more than half of VW's 10.8 billion euro ($12.16 billion) net profit in 2014 came from China, either in the form of shared joint venture profits, the sale of parts to its two joint ventures or royalties received. For General Motors, China is a key source of revenue and profit growth. It accounted for more than one-third of GM's record global sales of 9.9 million last year and generated roughly one-third of its $6.94 billion pretax profit, excluding one-time items. At the Shanghai auto show last month, CEO Mary Barra said GM remains bullish about China sales. The company forecasts 6 to 7 percent annual sales growth there "over the next coming years," she said. Ford Motor Co., in contrast, may see its growth plans slowed, but it won't be hit as hard by a Chinese slowdown because it is still playing catch-up from a low base. "When I think about 7 percent growth, I think that's a good planning base for China," David Schoch, president of Ford Asia Pacific, said on the sidelines of the Shanghai show. Through 2020, Ford's plans call for 60 to 70 percent of its global sales growth to come from Asia-Pacific, with China chipping in the lion's share. Japanese automakers also have a significant exposure to China, for better or worse. In the fiscal year that ended March 31, for example, Honda Motor Co. saw for the first time more operating profits from mainland Asia -- mainly China and Southeast Asia but excluding Japan -- than from North America. To remain competitive amid the new pricing pressure, foreign automakers are forced to shift production of more models to China and increase local content. This squeezes their lucrative business of selling components to their joint ventures, and it also means they will split more profits with their Chinese partners. Meanwhile, "The flourishing SUV segment has helped Chinese brands stave off pressure," analysts at LMC Automotive wrote, adding that seven of the top 10 best-selling SUV models in the first two months of this year were domestic nameplates. "Chinese automakers now have a renewed strategic opportunity to excel." Douglas A. Bolduc, Hans Greimel and Mike Colias contributed to this report.